Born in 1988, spent 2 years in France, and 1 year in England. After coming back to Japan, he started the career of DJ/Producer.He expresses a huge influence from black music as House groove. As the age of 20, GUY GERBER (Cocoon/Supplement Facts) discovered his talent, and he participated to Guy's label compilation. His track "DESMOND" which was released from Spanish label SUARA, was played by the Top House DJ, STEVE LAWLER in his essential mix for BBC Radio1, hosted by PETE TONG. Moreover, his unreleased tracks are played, and charted by the artists like REBOOT(Cadenza/Below), MEAT(Get Physical/Below), FREDSKI(Tartelet/Get Physical), and VAROSLAV(Supplement Facts). Not only a DJ/Producer, he is also known as an editor of world wide web magazine "honeyee.com" running by Hiroshi Fujiwara, Hirofumi Kiyonaga(SOPHNET. 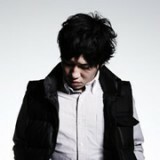 ), and Hiroki Nakamura(visvim).